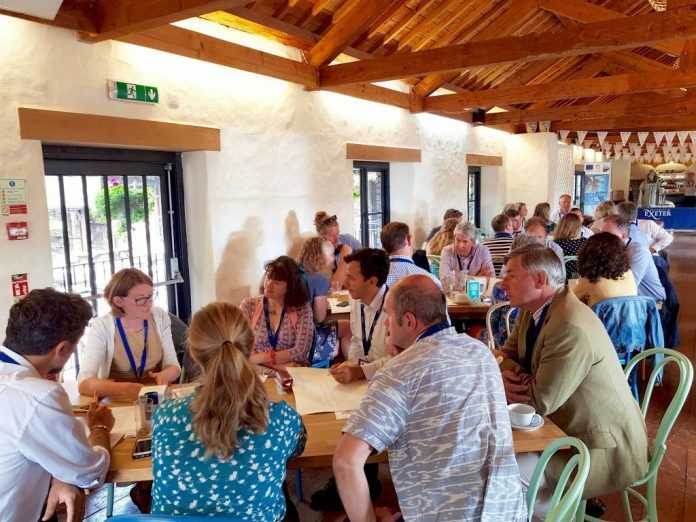 Businesses gathered at Healeys Cornish Cyder Farm, near Truro, recently to work together with the University of Exeter through the ERDF Future Focus programme to help bees and businesses thrive. Pollinators such as bees are in trouble; they have declined over the last decade, causing serious concerns for food security and our environment. Businesses from different sectors including hospitality, food and drink and tourism explored solutions to help reverse bee declines. Delegates participated in a morning of talks and activities teaming up businesses, conservation organisations, land owners and researchers organised by University of Exeter projects, BEE-STEWARD and Future Focus. Speakers included representatives from Cornish Food Box Company Ltd, Wasted Apple Co Ltd and Duchy of Cornwall Estate. University of Exeter experts Professor Juliet Osborne and Professor Stefano Pascucci described how cutting-edge research can help bees and business. Professor Osborne leads a team of researchers based at the Penryn Campus who have developed BEE-STEWARD; a virtual “safe-space” for pollinators that can be used to test out the effects of different pollinator-friendly land management options. Also attending the event was Faye Clifton from Green & Blue, a company that develops products for nature, including the bee brick – a nesting site for solitary bees. Every business can play their part in helping bees, whether it’s through planting pollinator-friendly flowers in the right place, supporting a supply chain that helps pollinators or creating innovative products to help bees survive. It is clear that Cornwall’s businesses want to do the right thing – working together to help reverse bee decline in order to enhance our environment and support the health and wellbeing of colleagues.